MUSIC IN SEATTLE's public parks is a fine old tradition dating back over a century. 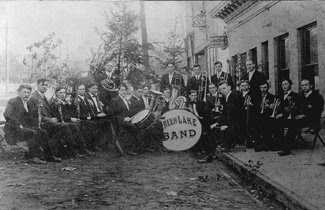 And Seattle's favorite summertime park -- Green Lake -- has a long history of hosting musical events. Well before myriad popular local 1980s bands rocked there at Bite of Seattle outdoor festivals (prior to being booted after noise complaints from crabby recent arrivals to the neighborhood) -- or Led Zeppelin shook (and possibly cracked) the foundation of the Green Lake Aqua Theater (5900 W. Green Lake Way N.) back on May 11, 1969, or Northwest rock 'n' roll pioneers like the Frantics and Ron Holden & the Playboys played sockhops at the Green Lake Fieldhouse in the 1950s -- the park featured plenty of musical performances & dances.